« Oh What a Bird! This blog was adapted from one originally published here on August 8, 2012. As I did with many others, I finished this post in the lobby of the Albatross Hotel on Sunday, December 14, 2014. We boarded the Ortelius on the afternoon of 15 DEC. We get back to dock on the the morning of 9 JAN. There is no wifi on the ship. That means that I will effectively and absolutely be without internet at least from 14 DEC through 9 JAN. At present I am further behind with answering e-mails than at any time since I have began answering folks’ photography-related questions about 25 years ago. 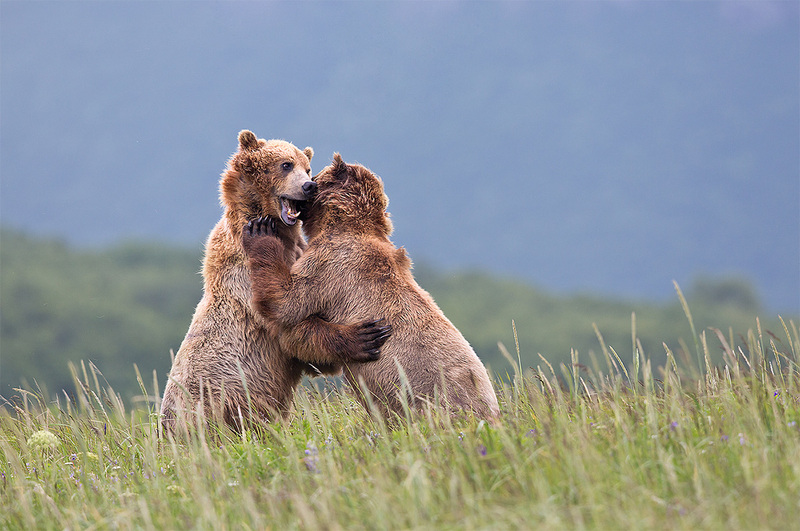 Squabbling Coastal Brown (Grizzly) Bears. This image was created at Hallo Bay, Katmai National Park, AK with the tripod-mounted Canon 500mm f/4L IS II lens, 1.4X III TC, and the Canon EOS-5D Mark III. ISO 800. Evaluative metering +1/3 stop as framed: 1/500 sec. at f/7.1 in Manual mode. Left of center sensor/AI Servo Surround Rear Focus AF active at the moment of exposure. Click here if you missed the Rear Focus Tutorial. You have traveled to Katmai National Park in hopes of photographing tiny Coastal Brown Bear cubs playing and nursing. But it was a very harsh winter that followed the poor salmon runs of the previous fall and there are no baby bears. And there are very few squabbling bears. And the salmon have not begun running in earnest yet. All that the bears are doing is eating grass. What to do? This Coastal Brown (Grizzly) Bear image was created at Hallo Bay, Katmai National Park, AK with the tripod-mounted Canon 500mm f/4L IS II lens and the Canon EOS-5D Mark III. ISO 400. Evaluative metering +1/3 stop as framed: 1/320 sec. at f/6.3 in Manual mode. One right and two down from the center sensor/AI Servo Surround Rear Focus AF active at the moment of exposure. Click here if you missed the Rear Focus Tutorial. As you have seen before, this image illustrates why I love the 5D Mark III so much; using my favorite AF Area Selection Mode makes creating pleasing compositions child’s play because it is easy to move the surround AF points quickly and because the AF system is so sure. Learn everything that I know about this great camera and save $10 by clicking here. As you will see, the list of unfinished items has dwindled considerably. The guide is nearly complete. When I am finished, the price will go to $50. You can find a large, beautiful bear in soft light, take about a dozen frames when the subject to imaging sensor is ideal, and then keep the best one or two images. This Coastal Brown (Grizzly) Bear image was created at Hallo Bay, Katmai National Park, AK with the tripod-mounted Canon 500mm f/4L IS II lens, the 1.4X III TC, and the Canon EOS-5D Mark III. ISO 400. Evaluative metering +1/3 stop as framed: 1/320 sec. at f/6.3 in Manual mode. Central sensor (right on the bear’s eye)/AI Servo Surround Rear Focus AF active at the moment of exposure. Click here if you missed the Rear Focus Tutorial. Here, I love the distant background, the big canines, and the bits of grasses. Have the group sit low and tight as two bears graze closer and closer. Then catch one in the act of chewing. This Coastal Brown (Grizzly) Bear image was created at Geographic Harbor, Katmai National Park, AK with the tripod-mounted Canon 500mm f/4L IS II lens, the 1.4X III TC, and the Canon EOS-5D Mark III. ISO 400. Evaluative metering +1/3 stop as framed: 1/800 sec. at f/7.1 in Av mode. Central sensor/AI Servo Surround Rear Focus AF active at the moment of exposure. Click here if you missed the Rear Focus Tutorial. Stand at full height behind your tripod to avoid getting the dark stuff at the top in the frame. Put the central sensor on the bear’s neck as it angled toward you. When you like what you see, create about a dozen images. Unbeknownst to me my rapid-fire-when-it’s-good approach paid dividends by catching the big bear with a mouthful of grass. This Coastal Brown (Grizzly) Bear image was created at Hallo Bay, Katmai National Park, AK with the tripod-mounted Canon 500mm f/4L IS II lens, the 1.4X III TC, and the Canon EOS-5D Mark III. ISO 800. Evaluative metering +2/3 stop as framed: 1/1000 sec. at f/5.6 in Av mode. Far lower left sensor/AI Servo Surround Rear Focus AF and recompose. Click here if you missed the Rear Focus Tutorial. Go small in the frame, put the bear down in the corner of the frame, and take advantage of the soft light and the glorious meadow. This Coastal Brown (Grizzly) Bear image was created at Hallo Bay, Katmai National Park, AK with the tripod-mounted Canon 500mm f/4L IS II lens and the Canon EOS-5D Mark III. ISO 800. Evaluative metering +1/3 stop as framed: 1/640 sec. at f/6.3 in Manual mode. Two to the right and two down from the central sensor/AI Servo Surround Rear Focus AF active at the moment of exposure. Click here if you missed the Rear Focus Tutorial. Again, the 5D Mark III’s incredibly wide AF array and my favorite AF Area Selection Mode were up to the task of creating a pleasing composition. Find a bear eating grass among the wildflowers, take off the teleconverter to go wide, get down in the river to get close to the bear’s level and to bring the distant conifer-covered hillside into the frame, and quickly choose the AF sensor that will create the composition that you want. The open mouth and the tiny bits of grass are both pluses. This Coastal Brown (Grizzly) Bear image was created at Hallo Bay, Katmai National Park, AK with the tripod-mounted Canon 500mm f/4L IS II lens, the 1.4X III TC, and the Canon EOS-5D Mark III. ISO 50. Evaluative metering at zero: 1/4 sec. at f/8 in Tv mode. Central sensor/AI Servo Surround Rear Focus AF. Click here if you missed the Rear Focus Tutorial. It was dark. We were in the skiff. I was not too thrilled. When things look bleak learn to think pleasing blurs. As I saw the bear approach the big fire-blackened blog I went to my 5D Mark III’s C2 Custom Shooting Mode blur pre-set. Just a twist of the dial and I am ready for blurs. To learn to create and set your Custom Shooting Modes and save $10 for just a bit longer get yourself a copy of our 5D Mark II User’s Guide by clicking here. Learn all there is to know about creating pleasing blurs with a copy of A Guide to Pleasing Blurs by Denise Ippolito and yours truly. 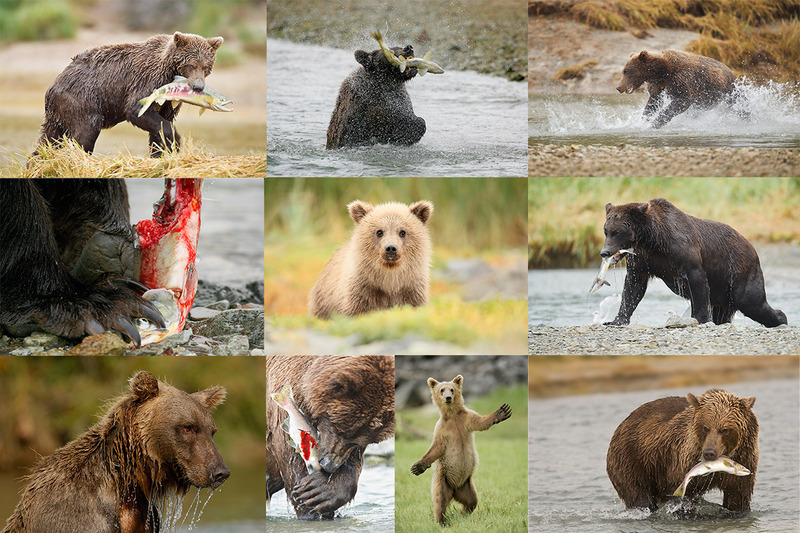 Bear Boat/Bears Catching Salmon IPT: September 1-8, 2015 from Kodiak, AK/6 FULL & 2 1/2 DAYS: $6699. Happy campers only! Maximum 8/Openings: 5. Plus the leader: Arthur Morris. If I do not have four deposit checks in hand by 1/31/2015 I reserve the right to scrap this trip so please do not purchase your plane tickets until you hear from me. 🙂 Only one to go.